She’s an ordinary woman, a little on the cautious side (in her own opinion), who tries every day to be just a little braver. Of course, she’s really very brave. She writes a blog and shows her thoughts, fears and mighty brain to the world. But she got me to thinking about bravery. I’ve done some brave things during my life. My Mom thinks I am very brave. Especially because I have traveled for business on my own, arriving in a strange city, and going where I need to go in my strange rental car, and then – the most difficult part for me – finding my way back to the strange airport. But I have a lot of fears. Many are good fears. It’s okay to be afraid of death and cancer and war. But many of my fears are rather irrational. This was my first fear. When I was a little kid, tucked into my bed at night, I was terrified to look at my window. I was sure that King Kong was going to be reaching his hairy arm through the window to grab me. Of course, I’m no longer afraid of King Kong, but that mighty ape has translated in adulthood as a fear of ground floor bedrooms. I know that there is no King Kong to reach me several flights up, but someone could definitely be reaching in from the yard. 2. Ventriloquists’ Dummies and Marionettes. I cringe at those creepy faces. I’ve seen too many Twilight Zone episodes. 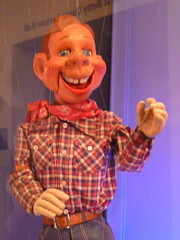 Even Howdy Doody is not exempt. He’s effing scary. I’m not afraid of all puppets however. 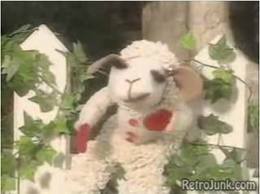 I like Lamb Chop. This doesn’t really need an explanation. Most people fear the dentist. But after years of sheer terror, I had finally found a great dentist – gentle, reassuring, quietly competent – I actually started to act like a sane adult in the dentist’s chair. Right up until he was arrested for stealing drugs from his own patients. Back to square one. I’m afraid that my heel will get caught in the treads, and I’ll be sucked into the mechanism. 6. 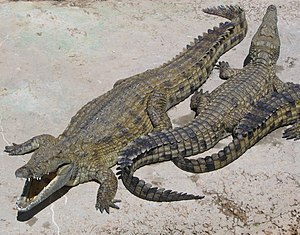 Reptiles, specifically crocodiles and alligators. I can’t even look at them on TV. Fortunately, I live in Connecticut. 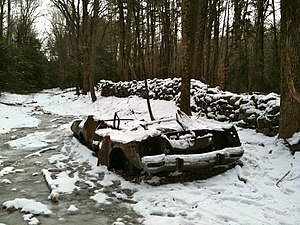 I’m afraid I’ll skid into a ditch on icy roads. Unfortunately, I live in Connecticut. My husband wants one. 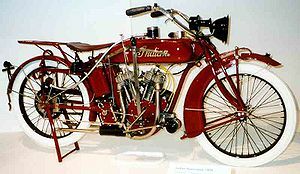 A vintage Indian motorcycle. I bought him a vintage Indian t-shirt. He’s not getting a bike. 9. Electrocuting myself. In the bathtub. In a thunderstorm. Thank you, Grandma. To clowns, you can add grownups dressed up as things like Mickey Mouse, the Easter bunny. Any smart kid screams. My daughter got her shoe lace caught in an escalator when she was 3. As she was about to step off. We had to hit the emergency stop button. In our panic we did not think to just take her shoe off. I had visions of her leg being sliced off by those horrid huge metal teeth. We yanked at her damn shoe lace for several minutes before we remembered that her shoe could be removed without her whole leg being removed. She is 22 now and we all still pause at the top of escalators and look down at our laces on our shoes. Even if we are wearing flip flops. SEE? I’m right to be afraid! I agree with many of your fears……the dummies and clowns creep me out. I am fine with escalators and heights, love the beach but fear the water. And I fear the witch in the Wizard of Oz—never could watch that movie and still can’t! Thanks for making me laugh with you at your fears!!! Hope I don’t have nightmares tonight about creepy dummies and crocodiles!!! Tunnels are scary…. and bridges. I’m afraid of the last one too. Not Grandma’s fault, though. It was some show my parents watched when I was a kid, and I happened to walk in on it to prolong going to bed. Got to see the whole science experiment in action, so to speak, as someone murdered their spouse that way. Yuck. Oh, my – the flying monkeys on Wizard of Oz. I am afraid of those things on your list, as well. Lots of kids got totally scared by Wizard of Oz, I guess. You with the flying monkeys, and Beth Ann with the witch. I was afraid of all those horrible evil brooms in Fantasia. How could that do that to Mickey Mouse? I am so flattered. Thanks for the compliment of mentioning my little blog on your brilliant one! To thank you, I will share some of my fears that I won’t be facing anytime soon: that a bridge I am driving on will collapse (and I won’t be able to save my children), that a tree will come alive, shoot through my window and grab me a la Poltergeist, and when the zombie apocolypse comes, all the fun people will be zombies and I will get stuck hanging out with really boring people. 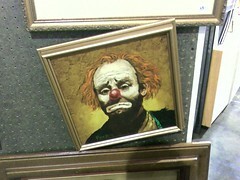 Also, clowns are just creepy. We are right to fear them. I think clowns were invented to scare children. None of the things on your list creep me out too much. But I hate being in the basement. We have a wonderfully finished basement, with television, pool table, bedroom, bathroom, etc. But I can’t stand to spend time there. Husband thinks I am nuts. Not fond of snakes, spiders or mice, either. 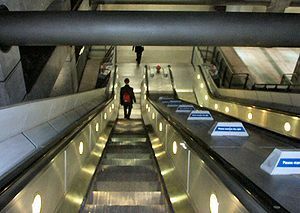 Oh, and as to the escalators, the shoelace thing or loose shoes are the most common way to get stuck on an escalator, I worked on a case about it….you have to be sure to stand on the center of the step and stay away from the edges. Attics are okay, peaceful even. Cellars are scary. For me it is the Three Stooges. I cannot stand to look at them! King Kong didn’t bother me so much, but I was deathly afraid of vampires. Born in Connecticut and bred in New England I never did get the hang of navigating icy roads, and now in Atlanta I cringe if I have to drive in just a quarter inch of snow! 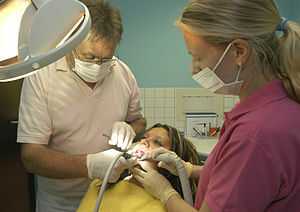 And dentists? Well they’re just plain bad news…even the offers of ‘laughing’ gas and, good God, Novocaine. Why does it take 20 minutes to inject that stuff? I seek bravery, too, but there are some things you just never get over! I KNEW we were made from the same batch of PlayDough! I share most of your fears, especially puppets and clowns. This post was funny! Love your writing! I still remember the fear my younger brother had of our “jack in the box”…When we cranked the tune “Pop goes the weasel”, he was hiding behind a couch or flying out the room. Guilty. We tortured him by playing it repeatedly. These comments are just adding to my fears! YES! Jack-in-the-boxes are VERY SCARY! Nancy – I love your blog, and named you for the Versatile Blogger Award. I know you’ve already been nominated recently, but I decided to choose blogs I love regardless of whether they had already been named. I think you already know what it entails, but the details are outlined on my blog. Also, would you mind if I added you to my blogroll? Thanks. I’d be honored to be on your blogroll. Your blog is terrific! I never miss it. I once heard someone say something recently, that I think will help you: The letters to the word fear stand for: False Evidence Appearing Real! Ha! I too get brave brownie points from Mom for having gone on business trips. And liking clowns is very brave, if you ask me. I lump my fears into two categories… things with an off switch and those without. As in, I won’t ride a horse but I will ride a motorcycle, it has an off switch. Spiders, snakes… no off switch. Yet who doesn’t secretly enjoy the triumph over a life long fear? Start with the easy ones, they’ll be the ones with the off switches. Hahaha! I have a fear of spiders, snakes, and anything else that has the possibility of eating me! Normal things to be afraid of I’m sure. Your list has got me thinking though. I know a woman who’s so afraid of snakes she can’t even look at pictures of them and a 30-year-old young man who’s deathly afraid of real clowns, pictures of clowns, doll clowns. Not a pretty sight. Your mention of http://ifiwerebrave got me looking. Thanks for the tip. I hate to bring this up, but remember at the end of the movie “King Kong” – he was way up at the top of the Empire State Building? He can CLIMB, really, really well. Sorry my clown post brought back some scary memories. But now I know he is not real… so I am safe as long as no one can reach in from the yard…i think….